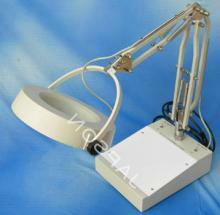 The Magnascope is an ergonomically designed, self illuminated optical magnifier at an affordable price. It is the optical eye of an inspection engineer. Magnascope is designed for industrial inspection of components, parts, moulds, bearing, watch movements, electronic components, wiring on printed circuit boards solder and joints. The scientifically designed Magnascope provides visual convenience to industrial workers during inspection. The Magnoscope is having flexible arms with robotic type movements. The industrial worker can move magnifying lens in any position of his convenience during inspections.